Camping is a great past time, especially if you have an RV to help you explore the open roads. However, it is important to follow some basic RV safety precautions to ensure you have a safe vacation. Here is a checklist of maintenance and safety tips to follow before you get behind the wheel. Never paint your propane tank. A darker color will absorb more of the sun’s rays, which could then cause an explosion. Do not travel with the oven, burners, or stove lit. Do not refuel your propane appliances while the engine is running. Inspect older propane tanks regularly for gas leaks. Invest in a propane gas detector. Brakes on RVs are different than the hydraulic brakes found on cars and trucks. Electric trailer brakes are pretty touchy and sensitive, so be easy on them and purchase a trailer brake controller so you will be in complete control when driving. It is best to use a 2-point system with these trailers as they have surge brakes. When driving a RV, you will have to take into consideration the extra height, length, and weight of the vehicle when you drive around corners. Here are some cornering tips that will help you stay safe on the road. Arc the turn, meaning you should swing your vehicle in the opposite direction of the turn so the body will follow the wheel. Install a trailer sway control hitch so you are steady on the turn. Finish the turn only once the back of vehicle has completely cleared the pivot point. Practice makes perfect. Practice on side roads and parking lots until you feel comfortable behind the wheel. 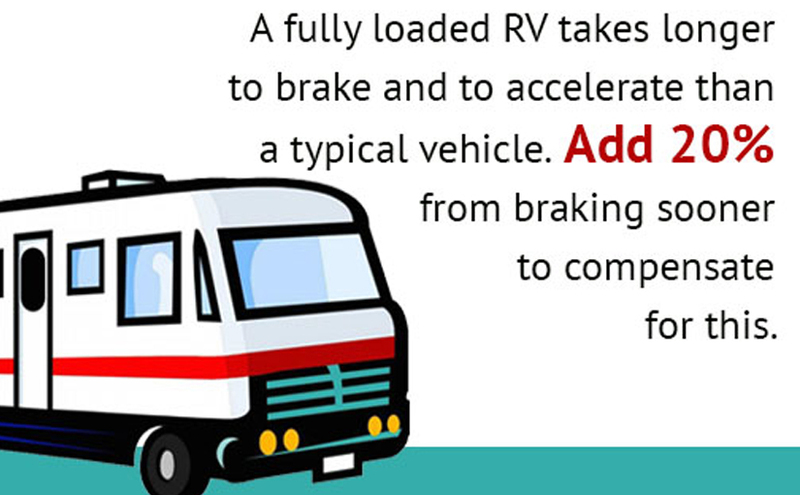 A fully loaded RV takes longer to brake and to accelerate than a typical vehicle. To compensate for this, give yourself about 20% more following distance and side clearance when braking, merging into traffic, or judging if you have enough clearance to go around a turn. Protect yourself and your family today by investing in trailer sway control and electric brake controllers from Hayes Towing Electronics.